It is time for Walker supporters to face facts, we are going to have a recall election in 2012. We can talk about the fundamental unfairness of the situation all we want, it will not change the fact that we must once again go out and defend our vote we took in 2010 against the forces of public sector unions and their cronies. With all that being said it is certainly time to analyze our adversaries in this recall fiasco in an honest way. Of course honesty and the Democratic Party of Wisconsin do not go hand in hand but I digress. Let’s examine the motley crew of leftists who have thrown their hat in the ring as of today. Let us start with State Senator Kathleen Vinehout. She believed in Wisconsin so much that she decided to leave the state instead of taking a vote to defend the financial future of it. Yes she was one of Renegade Senators who fled to Illinois. I am not sure but based on recent developments in Illinois could it be that she went down there to learn how to both raise taxes and cut services at the same time? She sells herself as a pro life Democrat and her voting record suggests that she is which should make that NARAL endorsement almost impossible to get and if she actually wins the nomination many of the extreme leftists will find it very difficult to vote for her on election day. Taking a shower might be the only thing a Madison leftist will find harder to do than to vote for Senator Vinehout. She also has another mark against her, she barely held on to her Senate seat in 2010. When you squeak out senate district by a measly 400 votes in your last election, I think your focus should be on working for your district and not on stealing the Governorship of Wisconsin. Speaking of stealing our next candidate Secretary of State Douglas Lafollette has been stealing taxpayers hard-earned money since he was re-elected in 1982. He is an extremist environmental lefty who will be turning 72 right around the time of the election. He has lost several times running for office and most people in Madison, including the liberals, view him as an eccentric old man who loves trees and organic lettuce. I will not waste a tone of space on Secretary Lafollette because quite frankly the majority of the people reading this blog would have a better chance of securing the nomination than this over the hill tree hugger has. In keeping with how these type of pieces are written I have saved the best for last. 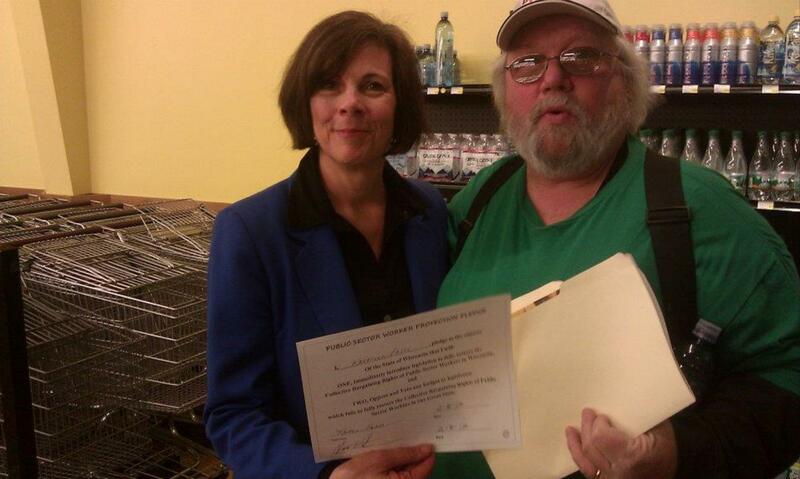 The union’s hand-picked candidate, Kathleen Falk, is the gift that just keeps giving if you support Governor Walker. The former Dane County Executive never met a tax increase she didn’t like as she increased taxes in Dane County in EVERY budget she ever proposed. Hey Kathleen anybody can balance their budget on the backs of the taxpayers, perhaps you need to think outside the Madison bubble. For some reason, even though she has not always been union friendly, she has become their chosen one. In fact she was the only candidate to pass their litmus test which was basically will you do everything the almighty union asks you to do even if it negatively affects the majority of your constituents. Not only did she say yes to their demands, she actually signed a document and has been running around Wisconsin taking pictures with it. This folks is what you call a bought and payed for politician. No wonder she received WEAC’s endorse about 8 seconds after she announced she was running. It is surprising to me that the labor movement in Wisconsin has hitched their wagon to a person who has already lost 3 times in statewide election, but then again nobody said these union hacks were smart. So as of today this is the Democratic primary field. Of course there is still time for a Barrett or an Obey to jump in the race but as of right now these three amusing candidates is what the Left is offering Wisconsin voters. I say send in the clowns as they would be an upgrade. This entry was posted on February 23, 2012, 12:09 pm and is filed under Uncategorized. You can follow any responses to this entry through RSS 2.0. You can leave a response, or trackback from your own site.